What do people say about Gifted Education? Is it necessary? Funded? Provided? Reaching local kids who need it? Why is it often so tough to find clear answers to these and other questions parents have about supports in place for GT learners? Is there a roadmap or silver bullet answer? Do you wonder whether the grass is greener somewhere else? Don’t go it alone! 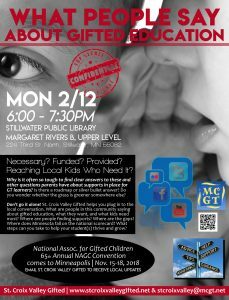 St. Croix Valley Gifted helps you plug in to the local conversation. What are people in this community saying about gifted education, what they want, and what kids need most? Where are people finding supports? Where are the gaps? Where does Minnesota fall on the national scorecard? What steps can you take to help your student(s) thrive and grow? It’s time to get some answers.